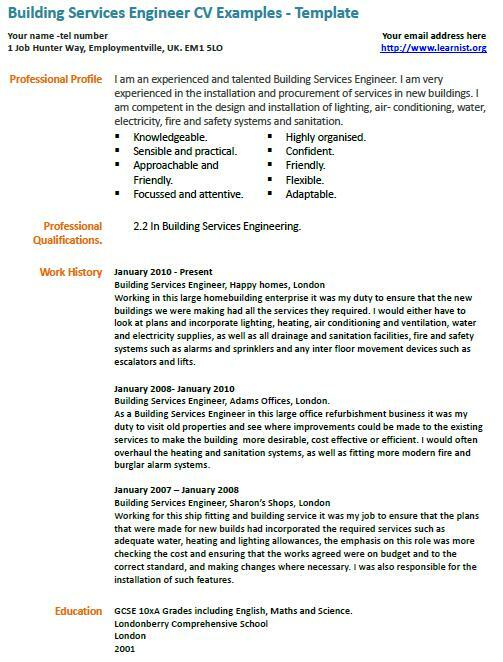 Building Services Engineer CV Example and Template. You can amend this CV example as suitable and start writing your own CV in seconds. I am an experienced and talented Building Services Engineer. I am very experienced in the installation and procurement of services in new buildings. I am competent in the design and installation of lighting, air- conditioning, water, electricity, fire and safety systems and sanitation. 2.2 In Building Services Engineering. Working in this large homebuilding enterprise it was my duty to ensure that the new buildings we were making had all the services they required. I would either have to look at plans and incorporate lighting, heating, air conditioning and ventilation, water and electricity supplies, as well as all drainage and sanitation facilities, fire and safety systems such as alarms and sprinklers and any inter floor movement devices such as escalators and lifts. Building Services Engineer, Adams Offices, London. As a Building Services Engineer in this large office refurbishment business it was my duty to visit old properties and see where improvements could be made to the existing services to make the building more desirable, cost effective or efficient. I would often overhaul the heating and sanitation systems, as well as fitting more modern fire and burglar alarm systems. Working for this ship fitting and building service it was my job to ensure that the plans that were made for new builds had incorporated the required services such as adequate water, heating and lighting allowances, the emphasis on this role was more checking the cost and ensuring that the works agreed were on budget and to the correct standard, and making changes where necessary. I was also responsible for the installation of such features.